As the cold weather holidays roll in, I look forward to family food traditions. Going into Thanksgiving week and celebrations in Birmingham with my family, food memory kicks in bigtime. There is a dish called “kushmagudi” (this is my own spelling; there is no official spelling) which is always on the Journey family tables at Thanksgiving and Christmas. It is simple Southern food and its name (and my phonetic spelling) has no precedence that I can find. My brother wrote a lovely essay about this dish a couple of years ago but since I haven’t been able to retrieve it, I will reintroduce the basics to “Professional Southerner” readers. My grandmother Eula Harbison used to make kushmagudi and I always assumed that it was a known thing, like salt on watermelon, pepper on cantaloupe, and celery sticks served with turkey. As long as I can remember, kushmagudi was on the holiday table so I would mention it casually and be surprised at the blank stares I received. As I lived and traveled around the country, I realized that nobody outside my immediate family seems to have a clue what “kushmagudi” is. Many might know some variation of the dish, I think, but not by that name. Kushmagudi is nothing more than a tasty mixture of crumbled cornbread with the potlikker of turnip greens. I say “nothing more” but I am convinced that one needs a cook’s instinct to pull off the right mix. I have always heard stories about Grandmother feeding the masses of her family and crowds from church at short notice in the ‘30s and ‘40s and having family move into her family home between jobs and houses, during travel, etc. Based on what I know, I realize that Grandmother’s kushmagudi may have been invented as Depression food and a way to make the food in the rural house and garden go farther. After Grandmother died in December 1995, I was asked if I would make the kushmagudi for Christmas. I will admit that I was daunted. I had eaten it all of my life but I had never thought about it. I relaxed and thought about the dish. I realized that it is a basic and instinctual recipe and that if one understands its components one should be able to make it in a satisfactory manner. Make 1-2 cakes of cornbread or use leftover cornbread if you have it (remember that sugar is never acceptable in cornbread). Boil up a pot of turnip greens with your favorite spices and seasonings. Bring the greens to a boil and simmer on low for at least a half hour. In a large mixing bowl, crumble 1-1½ of the cakes of cornbread. Ladle the potlikker of the greens over the crumbled cornbread in the mixing bowl and mix to your preferred consistency and taste. Let the mixture meld for a while, keep it warm, and serve it. I like to mix some collard greens with my turnip greens to vary the flavor of the potlikker a bit. Grandmother tended to use less spices in her greens than I do; she used salt and pepper. I like to add a little pepper sauce, sage, bacon fat, garlic powder, thyme, and other seasonings to the greens before I strain them into the cornbread. I also might add a small dash of sugar to the greens (but never to the cornbread). I also like to mix more of the actual greens into the mix. 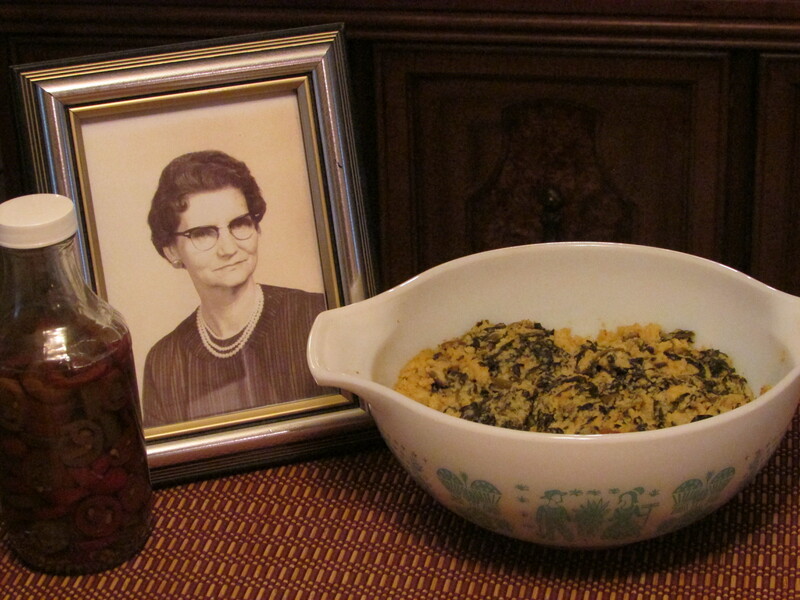 Grandmother generally just used the potlikker and served the seasoned turnip greens as a separate side dish. This is truly a recipe that may be adapted to your and your family’s preference. A bowl of kushmagudi with a glass of buttermilk is a perfect meal on a chilly night in late fall or winter. Even though kushmagudi is cornbread-based, it is different enough that my family serves it alongside Mother’s traditional cornbread dressing. I think one must sprinkle pepper sauce over a good kushmagudi at table. This is a dish that is always on my family’s table at Thanksgiving and Christmas and is often a side at my New Year’s Day luncheon. If you have a variation of this dish, or a variant name, I would love to hear from you. If you’ve never tried it, you ought to. It’s easy and tasty. This entry was posted in Eula McCarn Harbison, food, kushmagudi, the south and tagged cornbread, culture, food, kushmagudi, memoir, recipes, southern foodways, the south, turnip greens on November 23, 2014 by gedwardjourney.